The outcropping of brightly painted stilt homes, known as Stiltsville, standing one mile off the coast of Miami, has captivated the imaginations and the hearts of Floridians for decades, from urban legends about its wild days as an outpost for Prohibition-era gambling and drinking to treasured memories from the actual caretakers who have fought to preserve the area, now a national park, for generations. The seven wooden structures piercing through the turquoise-blue waters of Miami’s Biscayne Bay make for one of the world’s most majestic—if rarely visited—destinations. For the few who’ve traveled to the water-enriched community of Stiltsville, these seven structures represent an antidote to the hustle of Miami’s big-city scene. And for the even fewer who’ve set foot in these rustic, primitively equipped cabins, the site is a chance to relax and enjoy the 360-degree views of water typically offered by private islands while actually barely being on land at all. Three, two, one, jump! An early morning plunge after sleeping on the flats. About a mile from Key Biscayne’s southern tip, Stiltsville’s pastel-colored houses seem to hover above the bay’s glistening water, resting atop tall, stilt-like pilings that stand on seagrass flats. Boaters who stumble upon the structures have said they come out of nowhere, without preamble, a subdivision of seven homes with no entrance or exit signs. The houses, a waypoint for hundreds of seagulls, have no electricity. Cross winds provide air conditioning. Drinking water and ice, highly coveted commodities, are imported from the mainland. Rustic bunks line the walls of bedrooms, and wooden window shutters are all that protect each elevated bungalow’s inhabitants from the elements should an afternoon storm roll in. To the uninitiated, Stiltsville is the maritime equivalent of Neverland, a fairy-tale-like venue where boys and girls never grow up and can escape from mainland monontony. It’s been that way since the 1930s, when Eddie “Crawfish” Walker and a following of fishermen would congregate in the first shack in the middle of the bay, embracing Old Florida’s bucolic values. The idea of Stiltsville was then born, a concept of a Neverland of sorts that has stood the test of time against all odds—including threats from Mother Nature and mankind—for nearly 90 years. No more bootlegging, but the good times still roll out on the flats. Ashley wears a suit by Fleur Swim from modelcitizen. Lore has it that Crawfish Walker built a stopping point for fishermen going in and out of the bay, where he’d sell bait, beer and chowder. As more and more fishermen stopped by, more structures were built, including vacation homes for families looking for their own oasis in the bay. Far enough away from authorities on dry land, yet a close jaunt from the city, it also proved an ideal location for Miami’s playboys, who operated under the premise that whatever happened in Stiltsville stayed in Stiltsville. In 1938, a social space called the Calvert Club opened, inviting the elite to take their revelry onto the water. Two years later, another social venue—the multistory Quarterdeck Club—opened. If those walls could talk, they might describe a rocking scene with gambling, drinking and exotic dancers. The good times rolled well into the 1960s and 1970s, when the famed Bikini Club opened with—you guessed it—bikini-clad women blanketing the area. Miami Dolphins part-owner Earl Smalley had created a see-and-be-seen party-like atmosphere at his Stiltsville home. It’s even been rumored that the late Sen. Ted Kennedy held his bachelor party at one of the homes there. Over the last decade, the watery enclave has evolved into a tamer destination, where families, groups of friends, nature lovers and even corporations congregate for good old-fashioned campouts over the water and under the stars. But stories of the old days have been passed down through generations like treasured heirlooms. 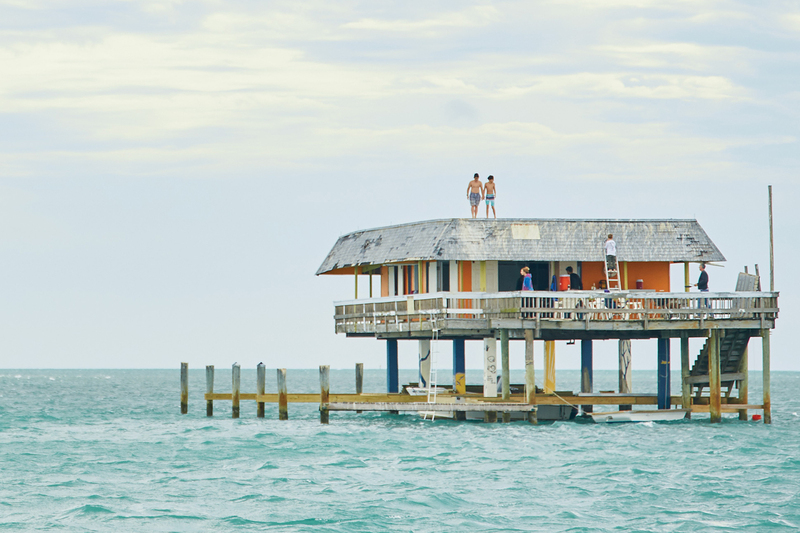 At its height, Stiltsville was home to 27 structures, mostly owned by well-to-do individuals who had the means to care for the uninsured buildings. Most of these homes succumbed to hurricane damage or fires, leaving the seven remaining buildings to carry on the community’s storied legacy. Though its location in an oasis in the middle of a bay might seem perfect, ironically, Stiltsville is nearly defenseless before the ravages of powerful storms, including September’s Hurricane Irma. 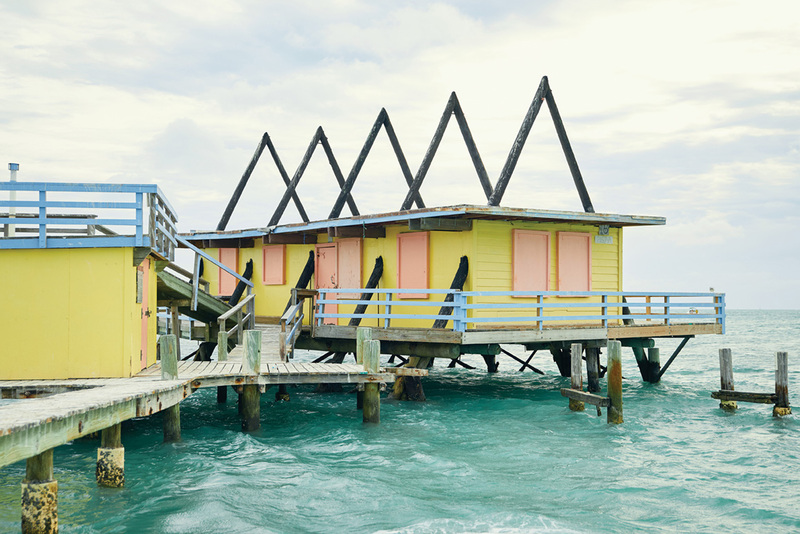 At one point a category 5 hurricane, Irma’s tropical-storm-strength winds hit Stiltsville with enough impact to damage nearly all of the structures’ docks and railings, as well as the roof of one bungalow. As of this writing, only one of the seven structures has been repaired enough for public use. The construction of the A-frame house uses remnant wood from a church in Miami and from the old Quarterdeck Club. As a teenager growing up in Miami in the 1980s, Kevin Mase remembers thinking how fun it would be to own a Stiltsville home. His friend’s uncle owned the house called Bay Chateau and would often invite Mase to come by to provide, in Mase’s words, “some free labor” by pressure washing the home and tidying up. Despite the incessant upkeep needed to maintain an over-the-water property that regularly took heavy beatings from the salt water and whirling winds, even as a teenager Mase saw the upside to owning a Stiltsville cabin. An opportunity to buy a place came nearly a decade later, and Mase and three high school friends pooled their money to purchase Bay Chateau. Built in the 1960s, it’s a two-bedroom, two-bathroom home with a small kitchen and sunken-floor living room and dining area. On a clear day, its bright yellow exterior and sea-foam-green roof can be spotted miles away. As the friends’ interest in the structure waxed and waned over the years, Mase’s commitment has remained so steadfast that five years ago he became the chairman of the Stiltsville Trust, a nonprofit organization created to care for and maintain each of the remaining seven buildings and uphold their legacies. The trust was founded in the early 2000s out of what the homeowners and some politicians felt was a necessity: They wanted to keep Stiltsville away from the destructive hands not of Mother Nature, but of mankind. The story goes that sometime in the early 1970s authorities began to consider some type of regulation of the otherwise lawless Stiltsville. In 1976, the Florida Department of Natural Resources recommended letting all Stiltsville leases expire on July 1, 1999, essentially shutting down the community when the clock struck midnight on July 1 and preparing for its eventual demolition. To compound matters, owners were instructed to remove the homes at their own expense, forced to pay for a demolition that they didn’t even want. Adding the proverbial salt to the wound, in 1985 the National Park Service acquired the land at the bottom of the bay, which meant that each lease was now in their hands. Residents had to pay $1,000 each year to “rent” their own homes. For Stiltsville families who had seen their homes pass through generations of hands, the idea that only one more generation could enjoy Neverland didn’t sit well. From the perspective of the National Park Service, private use of park property could not go on. After several more years of squabbling between homeowners and government officials—which gave way to lease extensions, eviction notices and several sides pitted against one another, including an emergent Save Old Stiltsville rallying support group—the two parties eventually reached an agreement. Since the mid-2000s, the structures have belonged to the National Park Service, the former homeowners maintain the responsibility of caring for their buildings, and the structures are available for public use via permits approved by the Stiltsville Trust. To most people, relinquishing ownership of a home to become caretaker of a space shared with the public is the equivalent of having your residence ripped from you while strangers meander through it every so often. But if that’s the compromise Stiltsville caretakers needed to make to save the homesites, then they would do it a thousand times over. Anastasia Ashley on the dock in a suit by Fleur Swim, shorts by J Brand, and tote by Sensi Studio available at modelcitizen and Gypset & pearl respectively. In fact, Mase and the other former owners seem happy to share their love of this slice of paradise with others who would normally never have the chance to set foot in one of the wooden bungalows. To date, the structures have hosted boy scout troops, school groups, burials at sea and at-risk kids from Miami who had never seen the ocean before. For retired firefighter Charles Davis, there are two obstacles keeping him from moving away from Florida: the boating lifestyle and Stiltsville. Raised in Miami, Davis had heard of this mythical place, where one’s troubles melt away alongside the undulating bay current, as a child. But it wasn’t until he retired after 25 years with the Coral Gables Fire Department that he started visiting Stiltsville. Ashely paddles between Stiltsville structures in Biscayne Bay in a swimsuit by Eberjey at Gypset & Pearl. Davis joined the Miami Springs Power Boat Club, a group of 75 boat enthusiasts, many of them firefighters, teachers and police officers, who socialize both on dry land and on the water. The Miami Springs Power Boat Club takes care of Stiltsville structure No. 7. Prior to last year’s devasation by Hurricane Irma, the Club had sprawling dock space for about 15 boats—quite expansive when compared with the other structures, which accommodate one or two boats. The club hosted epic get-togethers for up to 200 guests, including fishing tournaments for kids and civic groups. The narrative has changed tremendously since Hurricane Irma blew through Florida. Davis says the club’s structure isn’t ready for the public. The house and the docks received several hundred thousand dollars’ worth of damage. Along with other caretakers, Davis believes another rallying call to save old Stiltsville is in order. This time he hopes that donors will contribute to the Stiltsville Trust to salvage these structures from the latest chapter of destruction. It’s something that Siegel hopes comes to fruition. The Fort Lauderdale dad’s two sons, Ashton and Hudson, look forward to going out to Stiltsville with their troop to perform service projects on the Miami Springs Power Boat Club’s structure, like repairing rotted wood, cleaning seagull poo and other jobs. It’s a work party, but they love it. 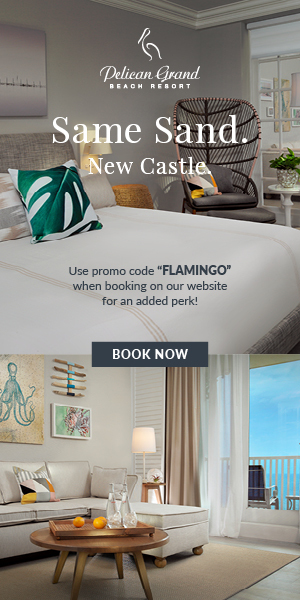 In turn, they receive the rare experience of truly living the salt life: fishing, snorkeling and jumping off the docks into the crystal-blue waters. To be sure, because Stiltsville is part of the National Parks Service, caretakers emphasize that nothing natural can be disturbed by people or taken from the area. After last year’s storm, the troop was devastated to hear of the damages to the structures—so much so that they sent a boat full of scouts to clean up the debris around Stiltsville. For Siegel, it’s the least they could do to help preserve Neverland, where his boys can still be boys for a while longer.